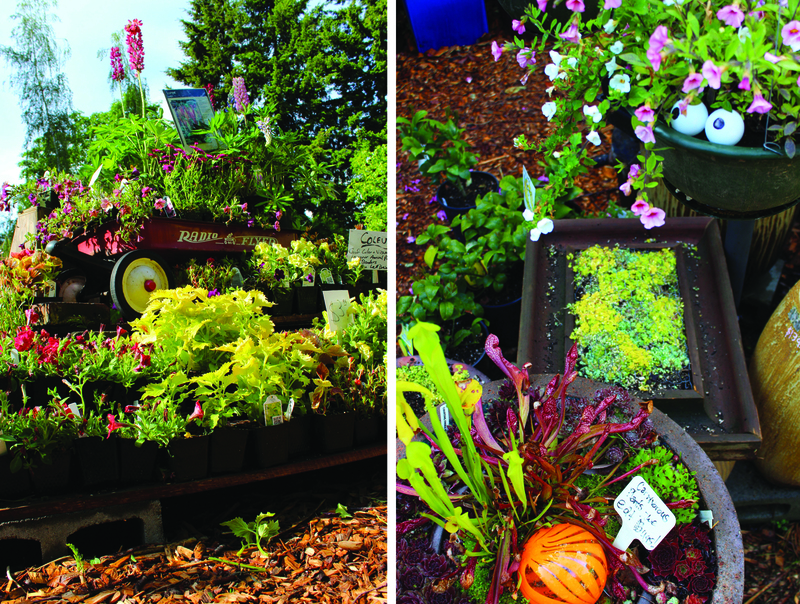 In the White Center neighborhood of West Seattle, there is a little woodland garden oasis called Village Green Perennial Nursery. 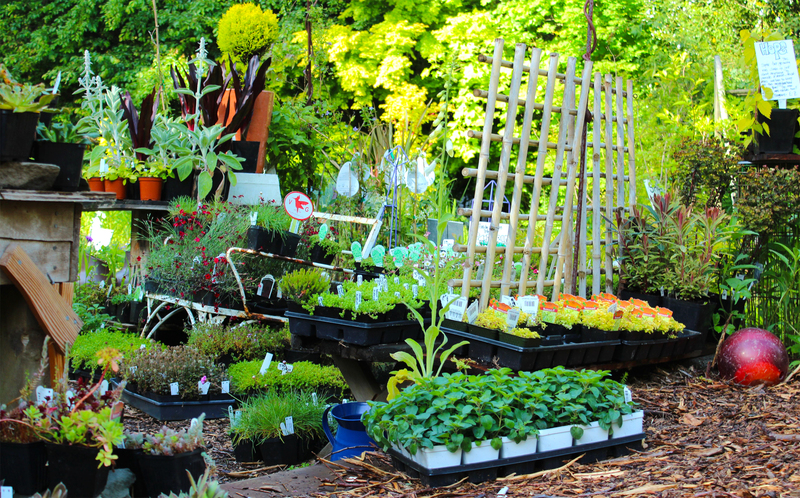 This nursery also happens to be a great place to get ideas for reuse garden projects as well. 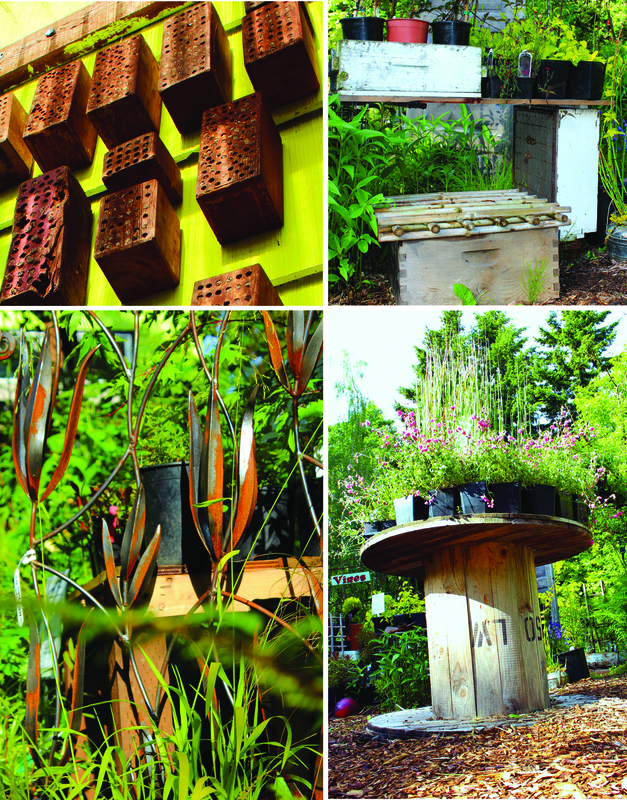 There are all sorts of great reuse and salvage projects at this garden center to inspire you – but there is one in particular which they submitted as a RE Store Rockstar project. Two volunteers, David and Crystal (who also happens to have been our amazing intern at The RE Store in Seattle – Thanks, Crystal! ), built the tables using pallets and stop sign posts that are scattered throughout the grounds of the nursery as plant displays. David partially deconstructed the pallets, removing the 2x members. Nail removal was a little more difficult that usual, since they had been placed originally with a nail gun, but otherwise a pretty straightforward process. Vera, the owner, received the parts used for the table legs through a neighbor barter trade. This neighbor stopped by and offered to trade her a couple red and white posts from stop signs and a metal, glass-top table for an old telephone (a 1950s crank telephone). Crystal chopped the legs to 24 inch lengths and they nailed them into the pallets. David screwed the legs into scrap pieces of wood for extra bracing. Other re-use and salvage project you can see at Village Green include: We really like their planters made from reclaimed antique bee boxes, and there are planted wire spools and metal chairs, reclaimed honeybee hives from a farm up the road, and “a bowling ball that floated into its current place during a rain storm – honestly – I swear!” Vera says.